As I wrote in my previous blog post, we arrived at Chincoteague Island before 9:00 am. It was way too early to check into our hotel, so we visited the Chincoteague National Wildlife Refuge on Assateague Island. The Chincoteague National Wildlife Refuge includes more than 14,000 acres of beach, dunes, marsh, and maritime forest. The refuge provides habitat for waterfowl, wading birds, shorebirds, and song birds as well as other species of wildlife, including the famous Chincolteague ponies, and plants. 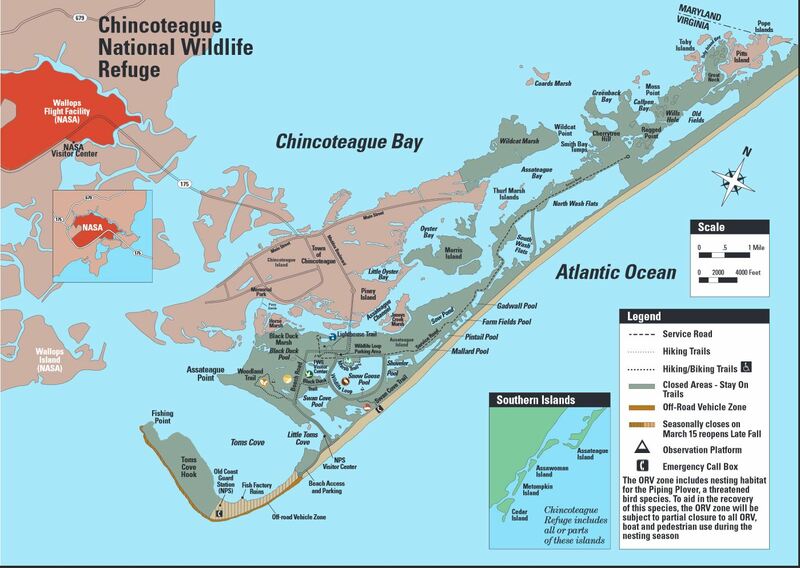 Here is a map of both Chincoteague and Assateague Islands, obtained from the Chincoteague National Wildlife Refuge brochure. If you right click with your mouse on the map and choose to “Open link in New Tab”, you can view the map as a larger size image. Once on Assateague Island we followed Beach Road to Tom’s Cove, hoping to see birds and ponies. We saw several egret but not one pony. This egret was in the marsh area where we saw ponies, when we visited a few years ago. After several attempts to capture a photograph of the egret with a successful catch, I gave up and continued our drive on Beach Road. Before reaching Tom’s Cove I found a few more egret. Upon reaching Tom’s Cove, we turned around to make our way back to Chincoteague Island. Before leaving Tom’s Cove, though, I snapped this photograph of a seagull that hasn’t learned to read. It was close to 11:00 am, when we departed Assateague Island. It was still too early to check into our hotel, so we decided to do lunch. We ate lunch at the Chincoteague Diner, which happened to be next door to our hotel. You may recall that it was Easter Sunday. It is traditional that we eat a ham dinner for Easter Sunday. The diner menu did not include ham, at least not the type of ham I am accustomed to. The special of the day was something called ham oyster. The ham was probably okay, but I wasn’t interested in an oyster dinner! I ordered a center-cut pork chop dinner; Bob ordered Stuffed Mushroom stuffed with crab meat.The service and food was good. After lunch, we drove through downtown Chincoteague. I will share photographs that I took on Chincoteague Island in a future blog post. We checked into the Best Western Chincoteague Island around 1:30 pm. Our hotel room was spacious with two queen beds, easy chair, activity table, and private balcony from which we could see the Assateague Lighthouse. After checking in we relaxed in our room until 4:00 pm, when we returned to Assateague Island. In my next Easter vacation blog post I will share the photographs that I took of Chincoteague Island. There will be more photographs that I took on Assateague Island, too, in a future blog post. Hi Linda, pretty captures of the Egret.. Sometimes the ponies move around and you have to take some of walks to find them.. The diner sounds OK, we may have to try it next time.. Have a great day. Thank you for the tip, Eileen. We will be sure to take some of the walks next time we visit Assateague Island! Although you didn’t see the ponies, you did get some great pictures on your drive at the refuge. I think I would have passed on the ham oyster as well. I love that area. I want to take the family to look for the ponies on our summer trip this year. The last couple years I have been outvoted and we have taken some day trips from DC to ocean city, Md. Still fun, but no real natural beauty to speak of. Linda: What a beautiful show, you captured the in flight Egret wonderfully. Hi LInda, I’m trying to catch up on your vacation… I’m SO far behind… But–even though you didn’t see the ponies, it looks like you enjoyed your time on that island. Neat photos… Love the Egret.